You've seen the Underbelly TV series by now no doubt. But have you ever considered walking in the footsteps of the notorious criminals that have formed Melbourne's unlawful past and shaped the very fabric of our city? If so, (and if you are brave enough) then Melbourne Crime Tours may just be the ticket to uncovering the stories behind the masterminds of some of Melbourne's most dastardly historic events. Held everyday of the week, Melbourne Crime Tours run for 4 hours and take you on a tour through the seedy scenes of some of the city's most infamous criminal events, encompassing many of the city's traditional landmarks as well as the locations of some of our bloodiest confrontations. As you weave in and out of Melbourne city traffic in your tour bus you will visit the real locations of our most notorious crimes and also take a guided walk through many filming locations used in the creation of the famously high-rating television miniseries about Melbourne's Gangland War, Underbelly. 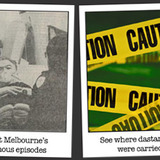 With your own personal guide to educate, inform and entertain you, some of Melbourne's most infamous episodes will be brought to life before your very eyes. Learn about the sad story of the infamous Society Murders of Margaret Wales-King and Paul King by their own son, hear about the Russell Street Bombings that claimed the life of young Constable Angela Taylor, the first Australian policewoman to be killed in the line of duty and try and uncover the motivation behind the Hoddle Street Massacre that turned a sleepy Sunday evening into a bloodbath in which 7 people were killed, shot at from a distance by perpetrator Julian Knight. The internal workings of the criminal world are in many ways beyond our comprehension, however with each hesitant turn you take into a darkened Melbourne alley you are sure to uncover the intricacies behind some of our most famous criminal events. A departure from the type of sight seeing you might usually be accustomed to (if it is taking photos and admiring architecturally pleasing buildings that you are after then perhaps this isn't quite the tour for you), Melbourne Crime Tours will instead take you to destinations in which you are likely to connect with and savour not only your own emotions but the emotions of those before you, who have experienced these events first hand. Throughout the tour you are likely to delve into the minds of our most vicious criminals and see where they have carried out their most dastardly deeds, learning about what motivated the violent slaughter of both criminal and innocent bystanders. Tours depart daily from the Old Melbourne Gaol (Monday to Friday) from 12pm and run until 4pm. Weekend tours are conducted twice daily (8am and 12pm). Tours also include a morning or afternoon tea stop. So whilst you are exploring the darker side of Melbourne you can experience something a touch sweeter, thanks to one of Melbourne's most iconic cafes Brunetti, home to some of the best Italian cakes and pastries. Terminating at Melbourne City Watch House (entry included in price of your tour ticket), your Melbourne Crime Tour ticket leaves you with the option to continue on to the Old Melbourne Gaol (with a 50% discount on your entry ticket). Here you can learn whether justice prevailed in the aformentioned crimes, some of which have shaped the fvery fabric of our city as we know it today. Why? Discover the darker side of our city by walking in the footsteps of Melbourne's most notorious criminal events to uncover the who, what, where, when and how. When: Monday to Friday 12pm - 4pm, Saturday and Sunday 8am - 12pm, 12pm - 4pm. Where: Tours depart from the Old Melbourne Gaol (377 Russell St, Melbourne) and terminate at Melbourne City Watch House (345-355 Russell St, Melbourne). Cost: $55 a ticket, which includes entry in the Melbourne City Watch house and any crime locations visited throughout the tour. Ticket also entitles you to 50% discounted entry in the Old Melbourne Gaol.